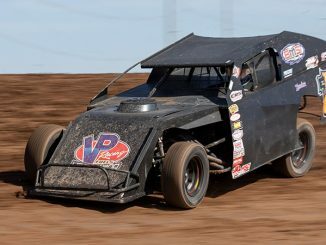 Tim Ward topped the opening night Arizona Mod Tour feature, earning $1,500 along with a spot on the Fast Shafts All-Star Invitational ballot along with the Friday IMCA Modified checkers at Arizona Speedway. 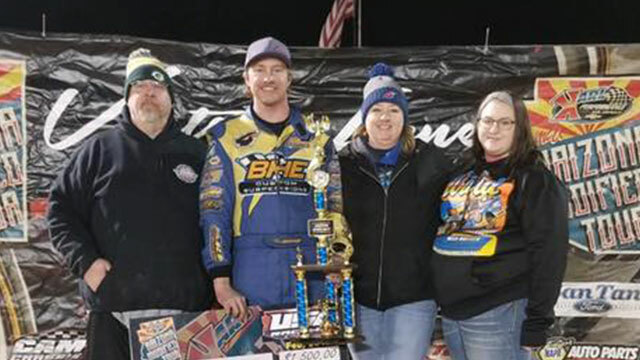 QUEEN CREEK, Ariz. (Feb. 8) – An action-packed night of racing at the 1/3 mile Arizona Speedway speedplant was capped off by a first-time winner in Arizona Mod Tour action as Arizona native and Iowa transplant Tim Ward bested the field of 26 stout IMCA Modified drivers. 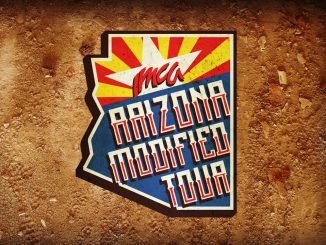 A tour record 92 Modifieds and 37 IMCA Northern SportMods checked into the pit gate for opening night of the third annual tour. Ward’s victory paid $1,500 and put him on the ballot for the Fast Shafts All-Star Invitational. Robert Hellebust and Joey Price led the field to green for 25 trips around the Arizona Speedway oval. Hellebust jumped out to an early lead, but a caution reset the field back to square one. Hellebust got the jump on the restart but Bobby Hogge IV challenged early on. After a few laps of battling, Hellebust started to pull away. 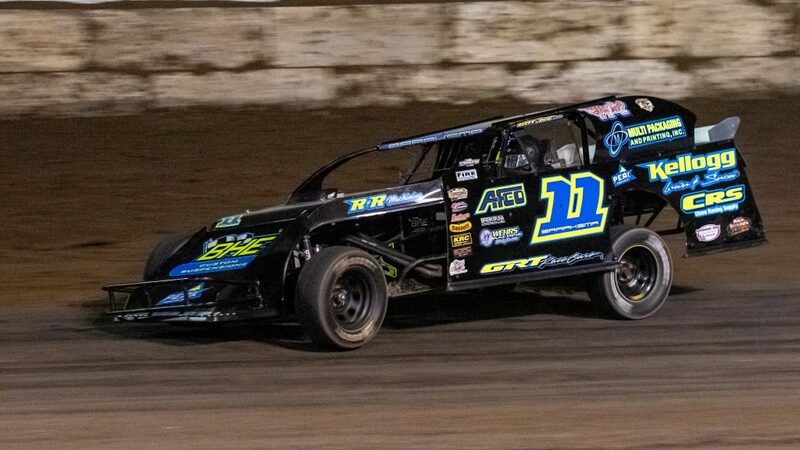 Ward started 11th on the field and had already made his way up into the top five within a few laps. He got past Hogge quickly and set his sights on Hellebust. About 10 laps in, Ward started slicing and dicing alongside Hellebust. With 13 laps to go, Ward secured the pass and set sail. Ward, Hellebust, and Cody Laney started to settle into their respective podium positions. Ward and Hellebust started to encounter lapped traffic when the second caution flag waved. A heartbreaking moment occured for the 9H machine of Hellebust, as he brought out the caution by smacking the frontstretch wall. With the field reset with six laps to go, Ward again started to run away while Hogge moved comfortably into second. Laney, Ricky Thornton Jr. and two-time defending tour champion Hunter Marriott exchanged sliders behind them. With two to go, Laney took his 5L machine off the track after running in the top five most of the race. Ward cruised to victory by an almost three second advantage over Hogge. Marriott, Thornton and Jason Hughes rounded out the top five. Ethan Braaksma and Justin Svoboda lead the Northern SportMod field to the green flag. A handful of yellow flags early on shook the field up a bit but Braaksma was not fazed. After every restart, he took a commanding lead and dominated the race. A few cautions late tried to thwart his winning plans but Braaksma led from the green flag to the checkered. Brady Bjella got up to second early on and faced a challenge from Chase Rudolf near the end. Bjella hung on to second, with Rudolf third and Fred Ryland squeaking out a fourth place finish over Cole Carver. Modifieds –1. Tim Ward, Harcourt, Iowa; 2. Bobby Hogge IV, Salinas, Calif.; 3. Hunter Marriott, Brookfield, Mo. ; 4. Ricky Thornton Jr., Clive, Iowa; 5. Jason Hughes, Watts, Okla.; 6. Dylan Goplen, Fargo, N.D.; 7. Ethan Dotson, Bakersfield, Calif.; 8. Jeff Taylor, Cave City, Ark. ; 9. Drew Armstrong, Benton, Ark. ; 10. Justin Kay, Wheatland, Iowa; 11. Kollin Hibdon, Pahrump, Nev.; 12. Alex Stanford, Chowchilla, Calif.; 13. Ross McCartney, Lahoma, Okla.; 14. Casey Arneson, Fargo, N.D.; 15. Eddie Kirchoff, Gillette, Wy. ; 16. Kody Scholpp, Estevan, Sask. ; 17. Joey Price, Great Falls, Mont. ; 18. Kelsie Foley, Tucson; 19. Spencer Wilson, Minot, N.D.; 20. Paul Stone, Winton, Calif.; 21. Cody Laney, Torrance, Calif.; 22. Robert Hellebust, Minot, N.D.; 23. Bubba Stafford, Wittmann; 24. Travis Denning, Sterling, Ill.; 25. J.P. Dowell, Killeen, Texas; 26. 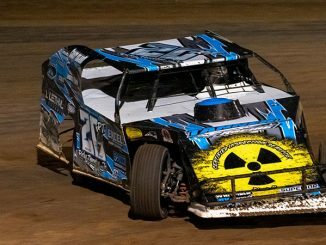 Jeff Larson, Freeport, Ill.
Northern SportMods – 1. Ethan Braaksma, Newton, Iowa; 2. Brady Bjella, Williston, N.D.; 3. Chase Rudolf, Prole, Iowa; 4. Fred Ryland, Brentwood, Calif.; 5. Cole Carver, Apache Junction; 6. Justin Svoboda, David City, Neb. ; 7. Ryan Moser, Englewood, Colo.; 8. Kelly Jacobson, Fargo, N.D.; 9. Mark Harrison, Coolidge; 10. Jake McBirnie, Boone, Iowa; 11. Matthew Mayo, Bakersfield, Calif.; 12. Kevin Johnson, Bakersfield, Calif., 13. David Jones, Chandler; 14. Brian Osantowski, Columbus, Neb. ; 15. Patti Ryland, Brentwood, Calif.; 16. Shelby Frye, Casa Grande; 17. Tate Johnson, Homestead, Mont. ; 18. Keith Brown Jr., Pittsburg, Calif.; 19. Bryan Moreland, Durango, Iowa; 20. Arie Schouten, Blair, Neb. ; 21. Jacob Madrid, Phoenix; 22. Bo Partain, Casa Grande; 23. Jim Horejsi, Marshall, Minn.; 24. Ty Rogers, Somerton; 25. Taylor Kuehl, Cave Creek.